Why would I need self storage in Santa Ana, CA? There are a variety of reasons why you might need self-storage in Santa Ana, CA. How much is a storage unit in Santa Ana, CA? The cheapest storage unit in Santa Ana, CA is $43.00 per month. What size storage units do you have available in Santa Ana, CA? In Santa Ana, CA we have sizes that range from 5'x5' to 20'x25' to suit your storage needs. How much is it for a 5'x5' storage unit in Santa Ana, CA? The cheapest 5'x5' storage unit in Santa Ana, CA is $63.00 per month. Santa Ana is considered part of the Los Angeles metropolitan area, and it offers easy access to both big-city amenities and the nearby California coastline. Despite being very densely populated, the city has managed to maintain a small-town feel, winning recognition for being one of the safest places to live in the country. In Santa Ana, you'll enjoy a variety of shopping, dining, arts and culture, as well as plenty of large parks in which to enjoy the mild coastal weather. In the late 1700s, the area that's now Santa Ana became the site of Mission San Juan Capistrano. The Spanish established settlements in the area, acquired surrounding land and obtained several land grants. When the Mexican-American War ended in 1848, the United States government acquired the territory known as Alta California territory known as Alta California, including the land that would soon become Santa Ana. Large numbers of American settlers arrived in the West, and Santa Ana was officially incorporated in 1886. Once the Southern Pacific Railroad established a major stop in the city, the population and local economy really took off. The arrival of the several large aviation companies helped to strengthen and diversify Santa Ana's economy, fueling its growth. Over the decades, Santa Ana continued to expand, attracting a diverse population of families and young professionals. Health care, manufacturing, education and government organizations provide a large number of jobs, and several major industries have a large footprint in Santa Ana. The city's largest industries include professional and business services, trade, transportation and education. If you're planning to join the job market in Santa Ana, you'll find a variety of jobs in the city's fast-growing industries of manufacturing, hospitality and health care. Many large corporations, including Behr Paint, Corinthian Colleges and Ingram Micro, are headquartered in Santa Ana. Local government agencies including the county of Orange and the United States Postal Service, also provide thousands of jobs in the area. The Downtown neighborhood is a bustling commercial center, benefiting significantly from recent revitalization efforts. It's home to the Santa Ana Artists Village, a funky collection of art studios, galleries and eclectic restaurants. The Metro East district is notable for being the site of the Santa Ana Zoo, where you can see one of the largest primate collections in the country, with species from all over the world. Joseph Prentice, an affluent former resident of the city who was known for his love of monkeys, donated the land for the zoo. Santa Ana's French Park is a well-known historic district, with homes dating as far back as the 1890s. Several historic homes from around the city have been relocated to open lots in French Park in order to preserve them. Midtown is one of Santa Ana's most popular entertainment districts. It hosts a number of local attractions, including the Discovery Science Center and Bowers Museum, which features an extensive collection of Native American artifacts. The Santa Ana Unified School District, includes public elementary, middle and high schools You can also enroll your child in one of the area's private schools, ranging from faith-based institutions including Mater Dei High School to specialized schools including the International School of Los Angeles. If you're going to be pursuing higher education in Santa Ana, there are several different schools to choose from. Santa Ana College is the local two-year public community college, and it provides a large variety of degree programs. Utilities: Southern California Edison is the city's electricity provider, while Southern California Gas Company supplies natural gas. The city's public works department manages water and sewer services. Garbage and Recycling: Waste Management provides curbside collection of trash and recyclables. You also have the option of requesting disposal services for yard waste and bulky items. 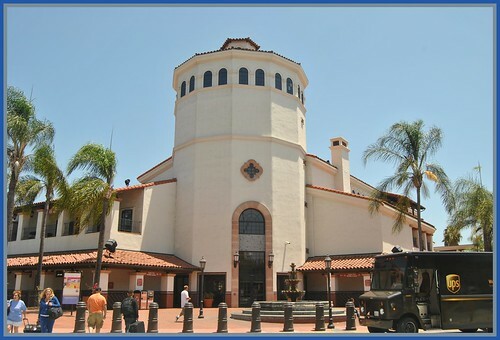 Transportation: Santa Ana offers public transit via a network of bus routes and also both Amtrak and Greyhound stations. Santa Ana is divided into more than five dozen neighborhoods. If you're looking for a central location in Santa Ana, keep an eye on rentals and homes for sale in the city's Downtown area, Flower Park neighborhood and Pico-Lowell neighborhood. Areas in the city's northeast corner, such as Fairhaven, Grand Sunrise and Lacy, are close to the city's major roads, and offer easy access to the rest of Orange County. In Santa Ana, the median home price is higher than the national average but more affordable than in many other California cities. Because the housing market is fairly active, you'll have a variety of options to find something that fits your needs. Our lowest priced units in Santa Ana, CA average $55.22 per month. 914 people have reserved units in Santa Ana, CA in the past 30 days. There are 9 locations within Santa Ana, CA's city limits. There are 5 locations in Santa Ana, CA that offer AC and Heating features.